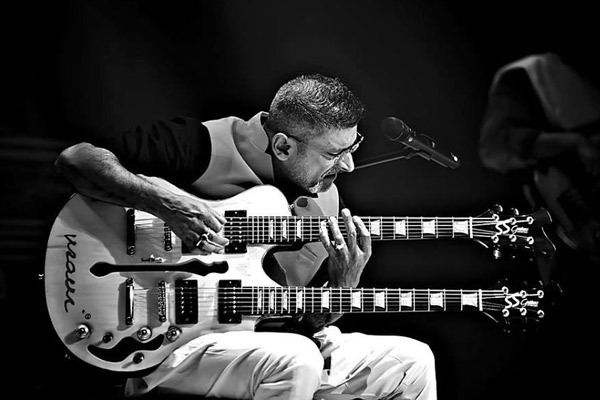 MUMBAI: Mumbai based guitar virtuoso Ravi Iyer unveiled the CD for his latest classical fusion album ‘Raga Punch’ with a live performance and the video screening of the instrumental ‘The Leader Follows’. Performing to a packed audience at Blue Frog, the evening was filled with mesmerizing Indian classical ragas, alaps, jugalbandi, and an enchanting mix of a variety of instruments coming together. The breath taking video of the instrumental ‘The Leader Follows’ was screened for the first time. Shot in the picturesque hill station of Lonavala by independent singer/songwriter/director KC Loy, the video features Ravi Iyer with his custom guitar, Chhintan Katti (Sitar) and Rupak Dhamankar (Tabla). Cutting across a busy city life and the serenity of nature, the video showcases a life between peace and chaos. “As I started working on my composition, a haunting melody began to play in my head. It seemed to be coming from very far away, drawing me closer. I tried to reach for it but it wouldn’t let me. So easing back, I slowly trailed behind. ‘Follow,’ I said to myself. It was like a new world opened out before me. The emotions were surreal! Sadness, frustration, happiness and elation, all together, in one melody. And that’s how ‘The Leader Follows’ came to be! The video had to try and emulate this feeling! Now that was tough one but we had a great time and that’s all that matters,” revealed Iyer further. Iyer also unviled the ‘Raga Punch’ CD supported by Vinay Menon, Manish Desai and Vishesh Menon from Vidhi Foundation, a foundation that encourages and supports such unique genres of music. Iyer stressed on the revival of physical CDs, which was lauded by the audience. 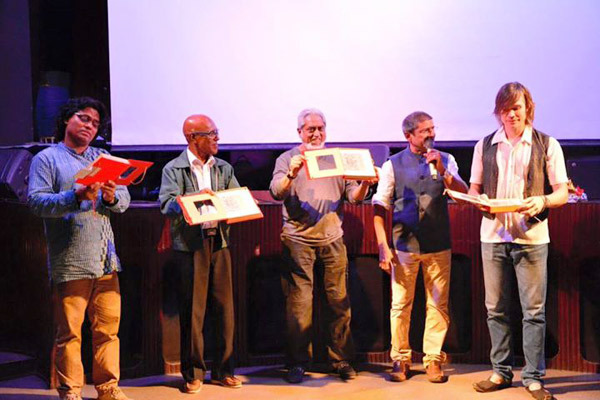 The evening was graced by the presence of eminent sitar player Ravi Chary, Luke Kenny, veteran drummer Bashir Sheikh of the band 60’s band Savages, renowned Trumpet player Joe Vessaokar, Iyer’s childhood friend Maxwell Rebello, who were each presented with the CD. Iyer mentioned that it was Maxwell Rebello who inspired him to pick up the guitar. Iyer later invited all the musicians who contributed to the album. These included Rupak Dhamankar (Tabla), Krishnan Narayanan (Mridangam), Chintan Katti (Sitar), Rajalakshmi Sanjay (Vocals), Saipriya Vishwanathan (Veena), Finix Ramdas (Violin), Shovon Mukherjee (Bass) - who was only part for the live set - Shehkar Kusuma (Sound Engineer) and Devaki Singh (Artwork). The band took to stage and started the performance with the track ‘Veena Vadini’ followed with other tracks of the album like ‘Inward Eye’, ‘Jogi Blues’ ‘The Leader follows’ and also few tracks from Iyer’s older album ‘Bends’. Vocalist Rajalakshmi Sanjay tested the crowd’s musical skills by engaging them with a small singing session and was delighted with their response. Captivating the crowd by an energetic tabla Mridangam jugalbandi, Krishnan Narayanan and Rupak Dhamankar added the spark to the musical extravaganza. KC Loy also performed on his hit single ‘Boondein’ with the band. The set ended with the high spirited performance of ‘The Rain Song’ where all musicians were present on stage. With all the instruments and vocalists coming together the performance ended on a high note leaving the crowd awestruck. ‘Raga Punch’ is the signature Ravi Iyer style of fusion music which has a perfect balance of traditional as well as a contemporary feel. The amalgamation of Indian classical with modern ingredients makes it a sound palatable to many. The album is available on various digital stores like OK Listen, CD Baby and iTunes. MUMBAI: 14-year-old talented singer Aditi Iyer has released her new single Miss Messy recently, which is written as well as sung by Aditi herself. Arjun Kanungo's 'Aaya Na Tu Reprise' has a melodious blend! MUMBAI: Music producer and singer Arjun Kanungo has dropped the reprised version of his popular song, Aaya Na Tu, on his official YouTube channel. MUMBAI: Late singer Mohammed Rafi's famous track Yeh duniya agar mil bhi jaye in late actor Guru Dutt's film Pyaasa is being recreated for the Kunal Kapoor-starrer Noblemen. MUMBAI: It’s always heartening to see youngsters think about the underprivileged. Especially young artistes, who themselves are finding feet in their profession.